Have you ever taken one of those Which Disney Character Are You? quizzes? I’m not ashamed to admit that I have. I mean, it’s hard to avoid those things, what with alllllllll the quiz variations, plus friends sharing results on FB. I see one, and I just can’t help myself – especially if it’s a princess one. Typical girl, I know. So, uh, yes. I’m now admitting that I’ve taken multiple such quizzes. And still, no shame. In my defense, though, it’s now become more of a test to see if I agree with the results. Because, I already figured out which characters I relate to most. By personal assessment, I’m basically Belle, with a hint of Jasmine and just a hair of Rapunzel. (See what I did there??) But, since I haven’t yet found a quiz with advanced, multi-character results, I gotta give props to any that tell me I’m Belle. Take Seventeen Mag. They aced it! Read that description. I mean, I’m literally working on my blog RIGHT NOW. And I do try to leave people better than I found them. High five, Seventeen. BuzzFeed, on the other hand, disappointed me. Normally, I’m all about the BuzzFeed quizzes, but Ariel? Not even Jasmine OR Rapunzel? I love The Little Mermaid. I do. And Ariel and I share that curious dreamer mentality and drive to succeed. But beyond that, it’s a stretch. Okay, enough with the quiz results. Let me get to the point, because there IS a relevant point. I swear! It’s not about taking silly quizzes, as blissfully time-wasting as that may be. And, it’s also not about those Disney happily ever afters. Nope. My point is that I’m drawn to these Disney characters because they are independent females seeking their own adventures. Given the title of my blog, this should come as no surprise! So, if all the Disney princesses are adventurers (or adventuresses?) why Belle + Jasmine and Rapunzel? I’m glad you asked. As an early reader, books have fueled my imagination for as long as I can remember, and I grew up believing there was “more than [my] provincial life” in small town Michigan. I’m also surprisingly fearless and stubbornly determined when facing challenges and pursuing my passions. Throughout life, I’ve even struggled to relate to many of my peers – and it would not shock (or bother!) me to know that many of them thought me peculiar for my introverted, nerdy, disciplined ways. Like Jasmine, I long to escape from a fully sheltered, structured life and experience the real, raw world – even if it means sacrificing some of the creature comforts I’m accustomed to. I also love cats and absolutely see myself falling for a man who loves flying and exploring the world just as much as I do. You may not know this about me, but I was once able to sit on my hair. It was that long!! Seventh grader me begged my mom to cut it and she finally did. No one ever called me Rapunzel, but I can relate. I’m also scrappier than I look, could win over a band of thugs, and I adore those floating lanterns enough to hunt down the source! So there you have it: me as a Disney princess. And, as funny as it sounds, these characters were probably my first female role models in terms of independent adventuring. So, hey, thanks Disney! And thanks to all those who thought it a good use of their time to create Disney character quizzes for people like me. Have you ever taken a similar quiz? Or, did you take one of the quizzes I posted above? If so, please do share your character results! That was fun! 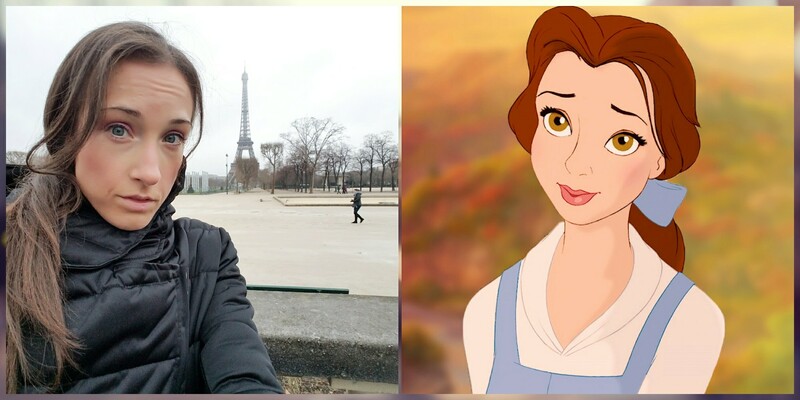 I was Belle also! Yay!! We’re kindred spirits, Linda!